Hairdressers hear all kinds of things. Just ask Hilary McCoy, a hairdresser with over 16 years of experience. Details about work, family, relationships and more come out in the time it takes for a haircut or color. A good hairstylist can even be listed among the items divvied up after a break-up. 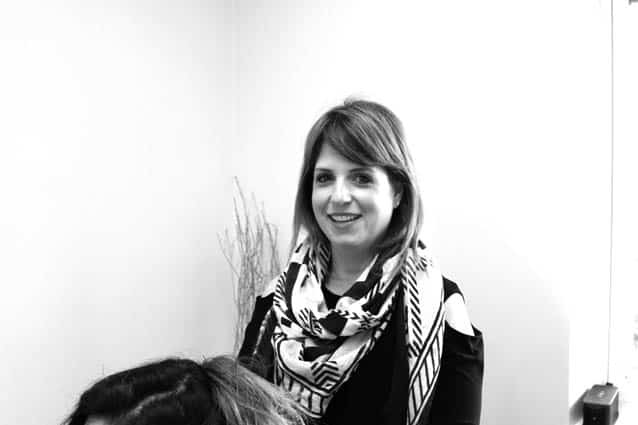 For McCoy, talking and listening to her clients is just one part of the job she enjoys. Now, she’s come back to her hometown of Rutland where she’ll be styling hair for Rutland County and beyond. McCoy grew up in the Rutland area, attended Mill River High School, and took marketing classes at the Stafford Technical Center in Rutland. After earning an associate degree in general studies from Castleton University (then Castleton College), she decided it was time to pursue her dream of hairdressing. At 19, she moved to Boston and attended school to become a hairdresser. She completed an apprenticeship under Dellaria Salon, which offered a hair cutting program designed by hair stylist John Dellaria. The salon she first worked in was in Brookline, Mass., and was busy, meaning she had to learn fast. “I went through their education very quickly and was put on the floor, given a chair and just started taking walk-ins,” she said. Today, she describes picking up the scissors for the first time as “terrifying,” but in six months she was already building up a list of regular clients. After six years, she had the opportunity to move to a salon on upscale Newbury Street in the Back Bay. “If you do hair in Boston, no one takes you seriously unless you work on Newbury Street,” she said. Over the course of working at three salons on Newbury Street, including G Spa, Gretta Monahan’s Grettacole spa and Will Charles Salon, she went through an audition process with Wella Professionals, an international hair color company, which allowed her to teach other stylists on Newbury Street how to use Wella products. Through her work, McCoy was also featured in national publications including Allure and Boston Stuff @Night. She married in 2006. In considering where they wanted to raise their family, Vermont was an appealing choice, since she and her husband have family in the area. “I wanted come back and have good memories with them,” she said. She and her husband recently closed on a house in Rutland and have begun moving in and making preparations for Christmas, which they’ll spend with their children, ages one and two. Since returning, she said she’s found Rutland in the midst of a rebound while attending mixers with the Rutland Young Professionals and the Rutland Region Chamber of Commerce. While renting space in the Blush Salon & Beauty Lounge at 60 Center St. she hopes to attract clients from the Woodstock, Middlebury and Manchester areas. She also hopes to apprentice new hairdressers. McCoy said the point of her business is to inspire comfort and self-confidence in her clients. “If someone feels they look the best with a mullet, then who am I to say they shouldn’t have it? I’ll give them the best mullet they’ve ever had,” McCoy said.